On June 3rd we will be holding the annual Bio Biology Quiz at Lincoln University where Canterbury Schools compete to see who knows the most biological trivia. Home team Lincoln High School are the defending champions and will go up against the best and brightest Canterbury Year 12 biology students. One of the set of questions this year is on information found on this blog! The answers to the 10 questions can be found in the following blog stories: 'Cover story: Pengiuns behaving badly', 'On the value of collections: pinning down the answer', 'On the value of ecology', '1080: delusion and confusion', 'Ecoblitzing the Southern Alps', and 'Swimming, not sinking, in the Southern Alps'. Welcome if you are a secondary student new to this site. Just to get you going, the answer to the first question is 'Alfred Wallace'. After 24 years I have finally completed my PhD after starting my research on penguins and other seabirds in 1990. Oh I was awarded my PhD in 1994 but the final piece of research from that study was published this week in the journal Cladistics. Just to match the gravitas of the situation some photos of penguins that we had sent in were used on the cover of the journal. It's a curious fact about scientific data that some data can be out of date (or superceded) before the study is even completed whereas other data can be as relevant 100 years later. Luckily, my penguin behaviour data was of the long-lived variety. My PhD, at the University of Otago, looked at trait evolution in seabirds. One part of the research was on coevolution of feather lice and seabirds while the other was on behaviour evoultion in the same seabirds. I submitted and defended my thesis in 1993/1994, a time when Clinton was running for president, the biggest earning film was a Disney film (The Lion King), the soccer world cup was about to take place and Russian troops were being ordered into a former soviet area (Chechnya). I took up a lecturing position at Lincoln University where I busily published my PhD research over the next few years. My last chapter to publish was one in which I looked at whether penguin behaviours are passed down over evolutionary time from one generation to the next. The short answer was not so much, certainly compared to pretty much all other groups looked at. However, to really answer this question I needed to have a good estimate for penguin phylogeny (how they are related). In 1994 I didn't have one. Over the next decade I worked with a number of people to collect penguin samples for molecular analyses and this culminated in a reliable penguin tree in 2006. I blew the dust off my penguin behaviour data and went to work. Some of the analyses were still not sophisticated enough to answer some of the questions that I had but by around 2010 there were tests available that I could use. I analysed the data, got my results and wrote up my manuscript. Basically penguins behave badly in the sense that their behaviour does not mirror their evolution but seems more constrained by living in a marine environment. You can read more about it in the EcoLincNZ article "Southern Accent, penguin descent". By around mid 2011 I was able to submit my work to the journal Cladistics. And then my coauthors, my former supervisors Graham Wallis (University of Otago) and Russell Gray (University of Auckland) and my colleague with interests in behavioural evolution (and one of my groomsmen!) Martyn Kennedy (University of Otago), waited. And waited. And waited. After repeatedly checking with the editor we finally got our reviews back 16 months later! This blog post was written by postgraduate student Sam Harvey as part of the course Research Methods in Ecology (Ecol608). Sam revisits a Lincoln University research area that examines the fate of toxins in dead target animals in natural ecosystems published in 2013. This is not another rant about why we should or shouldn't use 1080. I would instead like to highlight the hazards through which 1080 poses a threat to non-target species via secondary poisoning and trophic transfer. If one was however looking for such an article that stated the issues and gave both arguments for and against the use of 1080 a useful read can be found here. 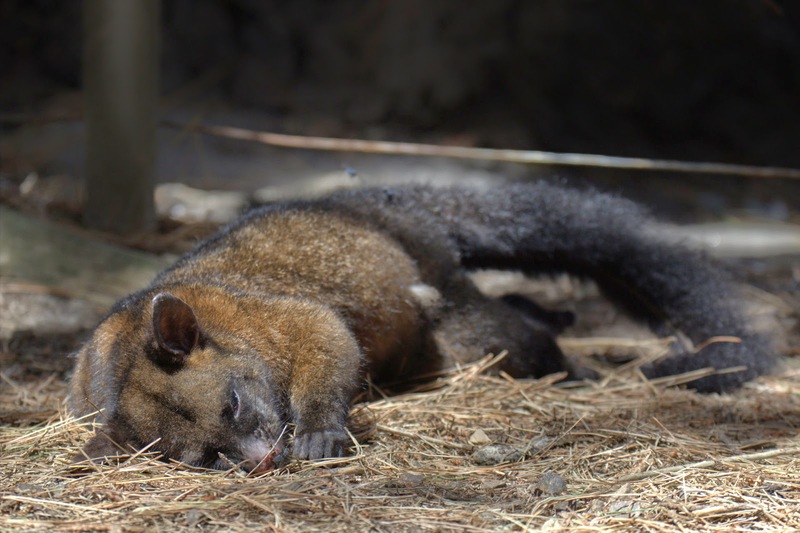 For readers foreign to this topic, 1080 or sodium fluoroacetate is the poison of preference in New Zealand for control of the introduced brush-tail possum. Although an effective control option for this pest, poisoning of non-target animals such as native birds and domestic animals occurs. These animals are often not poisoned directly from bait ingestion but through ingesting the toxic offal of poisoned animals which is called secondary poisoning. This has led to 1080 falling into disrepute with some of the New Zealand public. 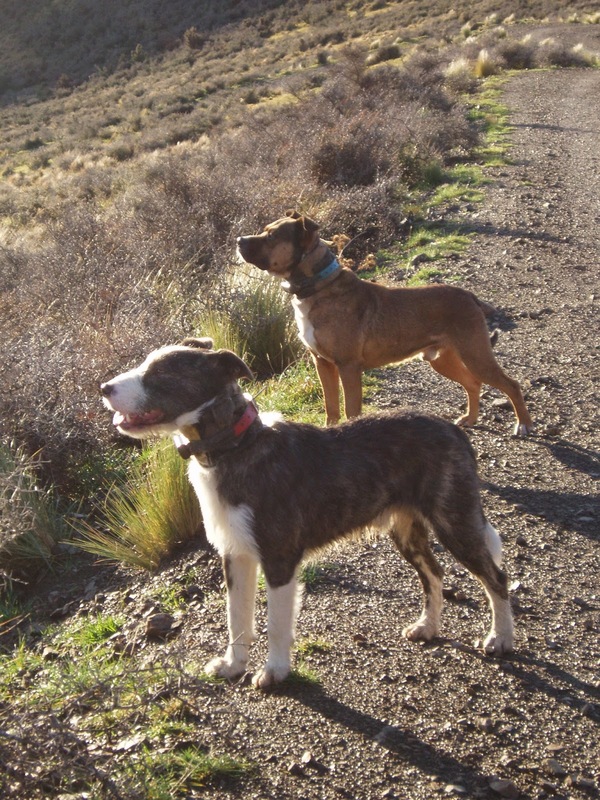 I am a mad keen pig hunter, and there isn't a lot in this world I love more than to watch the dogs work for a scent. Once they have the scent they take off into the scrub hot on the tail of some beast that could either fill my freezer or give the hounds a good hiding. Suddenly a bail bark erupts at the bottom of the gully, the dogs have found him, and I sprint toward the sound as fast as I can. As I get closer, the occasional squeal and grunt emerges over the chaos of barks; the dogs are holding him now so he's as good as mine. I close the final meters and grab the pig so I can finish him off with a knife (sorry to you animal lovers but he wasn't doing the ecosystem any favors). I sit down for a rest with the dogs and notice the pup is missing so go to work trying to track it down. I find it a little way down the gully looking a bit sick lying next to a half-savaged possum carcass and my heart drops. The thought of 1080 killing one of your mates is pretty tough. I have never been unfortunate enough to experience this (largely because I respect the 1080 signage around control areas). However, pig hunters being pig hunters, a fence and a sign can mean little and the scenario I depicted above has happened to more than a few keen hunters. This is the same for walkers with their domestic pets who, thinking they know better, ignore signage and warnings just to take their dog for a scenic walk. I speak of dogs primarily due to their susceptibility to 1080. For dogs the LD50 (the dosage required to kill half of a test population) is only 0.07 mg/kg body weight which is relatively low when compared to other animals such as birds which have tolerances ranging about 10 mg/kg body weight. So your average 12 g cereal bait laced with 1080 can kill several dogs. This low tolerance in dogs means there is a high risk of secondary poisoning when toxic offal is consumed. It's time to look at this from an operational manager's perspective. 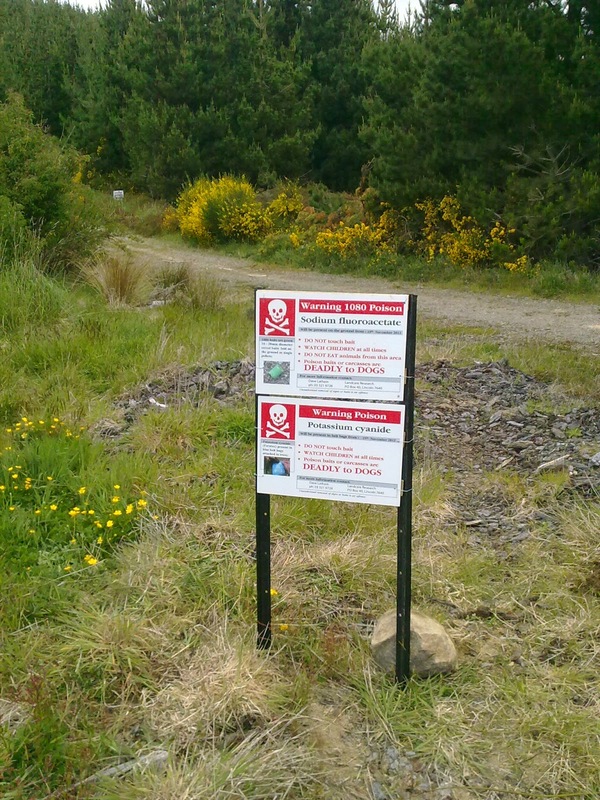 By law 1080 signage must be positioned at all normal points of entry to a control area and remain there until 6 months after the last application. How do we know when it is safe to take the signs down though? When is the danger of poisoning really over? Well it all depends on the environment, whether it's hot or cold, dry or wet, open or enclosed. All of these factors affect the rate at which 1080 degrades and toxic offal putrefies. 1080 degrades relatively slowly in possums, the study by Eason, Ross and Millar which this blog is based on found concentrations ten times the lethal dose for dogs being in possums 25 days after death. Lethal concentrations of 1080 were also found in sika deer stomach (5.66 mg/kg) forty days after death. So we know that persistence in soft tissue could lead to fatal secondary poisoning for some time. However, could there be another part of the carcass that poses a threat long after the soft tissue has degraded? Bones remain long after death and if sufficient concentrations of 1080 could be found in bone marrow then danger of poisoning in dogs may persist well after a carcass has degraded. 1080 was shown to persist in deer bone marrow for 213 days in Eason et al. 's study however speculation within this paper suggests that this could be even longer. The same study found concentrations of 1080 in deer bone marrow (0.59 and 2.3 mg/kg day 30 & 40) which suggest a dog would need to consume 500 g to 1 kg of toxic marrow for there to be a risk. It was then suggested that 1080 concentrations may be even higher in possum bone marrow. So if I were to speculate I would suggest that the current period of 6 months after 1080 application before dogs can be present without a leash is a realistic time frame (Dogs may be present earlier than that when on a leash as the owner can completely supervise their pet). Further research into possum bone marrow concentrations may suggest this period is increased. However, I can't see this period extending to anything more than 9 months especially with current research into reducing the size of 1080 cereal baits which will mean that individual dosages are reduced limiting the concentration of 1080 in toxic offal. But wait, if a dog can be poisoned through eating toxic carcasses shouldn't that mean that other non-target species could be poisoned too? This could suggest non-target species, such as native birds and insects, may not only be at risk from direct consumption of 1080 pellets but through trophic transfer as 1080 enters the food web. 1080 has a relatively short half-life and as a result bioaccumulation is not a huge factor. 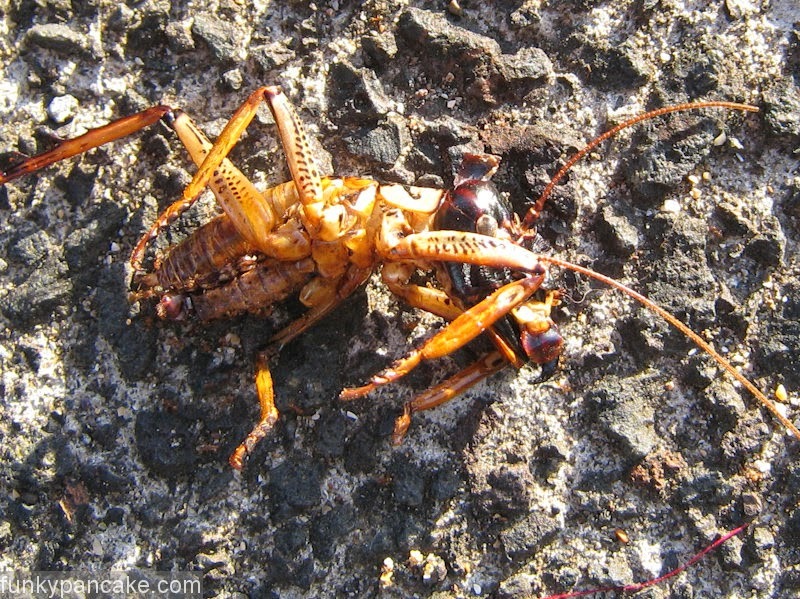 However 1080 concentrations have been found in several insect species after 1080 application, including cave weta, tree weta and some cockroaches. This may mean that ingestion of 1080 either directly from baits or from toxic offal could cause insect mortality. However studies have shown that weta survive 1080 ingestion even at concentrations of 15 mg/kg after which all traces were eliminated after 6-10 days. Similar results have been produced for ants where 1080 traces were eliminated after several days although some ants consumed enough for a fatal dose. If insectivores were to eat toxic insect material then trophic transfer could occur to animals feeding on those insects. The problem with this is that I see two potential limitations. One, the relatively short half life of 1080 would result in a small window of time where poisoning could occur and two, the insectivores that ate these individuals would primarily be birds which generally have a higher tolerance to 1080 anyway. Regretfully, some poisoning of non-target species is going to occur during a 1080 operation. The overwhelming evidence is that the number of these individuals is insignificant when weighed against the benefits that these species can gain through the removal of unwanted predators. In conclusion I believe that secondary poisoning with 1080 is an issue in New Zealand due to emotional attachment to the affected species. The poisoning of dogs and other domestic animals occurs but is highly avoidable if signage is respected. Furthermore the poisoning of native fauna is evident but the death of these individuals is insignificant compared to the benefits gained from the species as a whole. For more on 1080 and the current 'battle for our birds' look here. Eason, C.T., Ross, J., Miller, A. (2013) Secondary poisoning risks from 1080-poisoned carcasses and risk of trophic transfer - a review. New Zealand Journal of Zoology 40(3): 217-225. All around the world, natural history collections are under a major threat. This major threat comes not from ravenous specimen eating beasties, or changes in the ethics of collecting specimens with the insidious infiltration of the idea that a mixture of DNA and photography can be as good as a real sample, or the general aging of the curator workforce (although all of these things do constitute small and present dangers). No, the real threat come from ignorance, a lack of knowledge and value about how vital these collections are. Once something is perceived as of little value then it becomes vulnerable in the inevitable next round of cost cutting. All around the world collections are under threat from closure in order to save money. 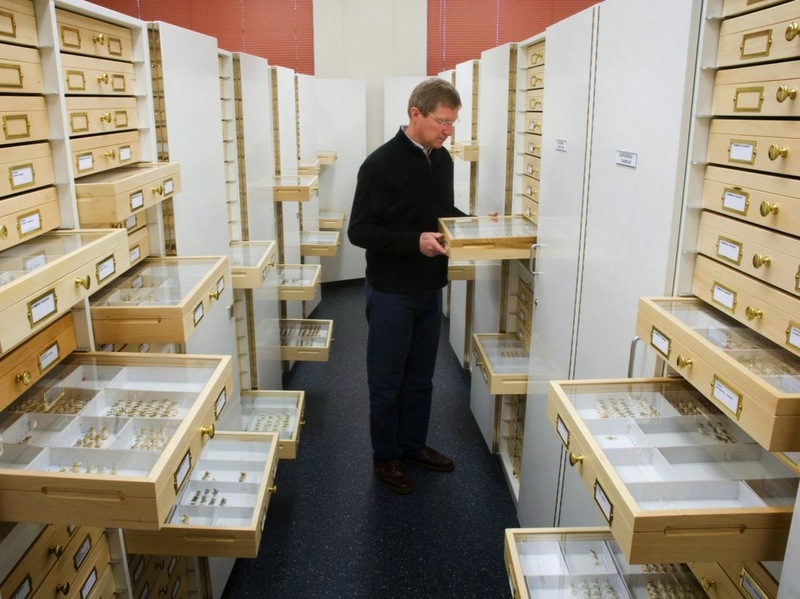 That’s certainly the case here at Lincoln University where our Entomology Research Museum, one of the largest collections of New Zealand insects in the world, is under this threat of closure, as well as the loss of our curator John Marris, in order to save money. So why are collections important? Incidents such as the recent Queensland fruit fly scare, the spread of the clover root weevil throughout New Zealand’s productive pastures and the devastating impact that potato/tomato psyllid has had on the potato and tomato industries highlight the importance of insects to our economy and environment. A fundamental part of any pure and applied insect study depends on properly identifying specimens due to their great diversity, small size and the often similar appearance of species. In New Zealand we have over 10000 named species and an estimated 10000 more yet to be named. We have more than 1000 introduced species, many of which are significant pest species inflicting multi-million dollar costs to primary production as well as impacting on our natural environment. Insect reference collections are vital in providing certainty as to what organism is being studied. In entomology this is not a straightforward issue to deal with due to the great diversity of insects and their similarity of form. Much of the New Zealand taxonomic literature dates back to the 1800s when species descriptions were rudimentary and insufficient to allow successful subsequent identification of species. The role of insect collections is not limited to identification. Collections are used as a basis for new species descriptions, as records of insect presence, abundance and variation in time and space and, with recent developments in molecular methods, provide a valuable source of DNA for a wide range of analyses. In order to emphasise the importance and long-term value of a ‘working’ collection, John Marris (our curator) offers this story about just one of our 250000 pinned specimens. 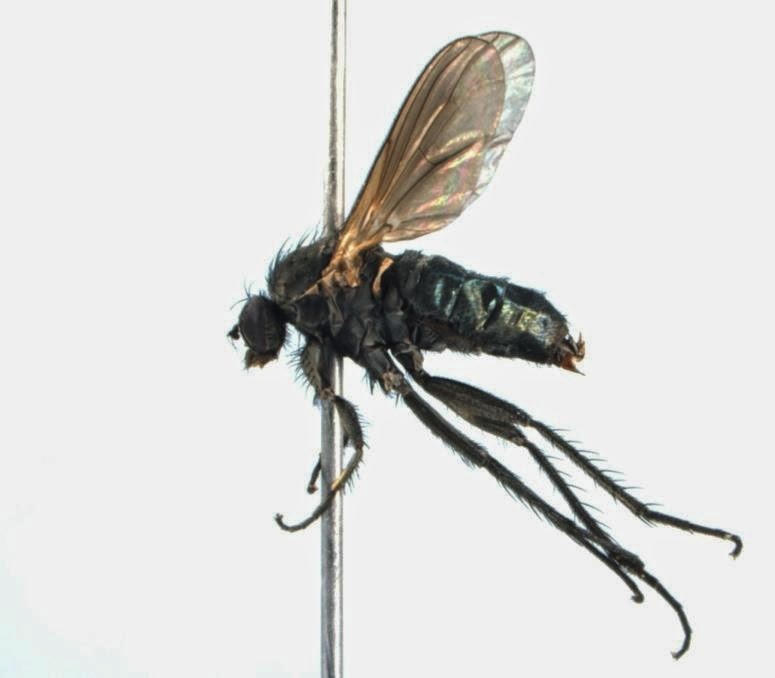 "Ostenia robusta is an endemic New Zealand fly, described over 100 years ago by F.W. Hutton, who was Professor of Biology at Canterbury College. Hutton taught natural sciences at Lincoln over the first two years of its existence (1880-81). 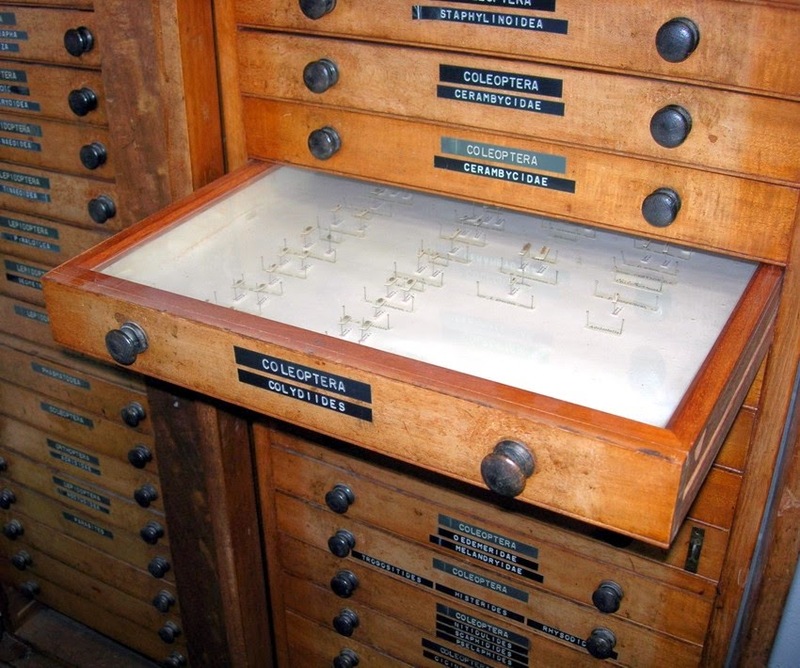 Hutton’s collection of insect reference specimens is held in the Entomology Research Museum 133 years on and remains in active use for research. After Hutton’s description, this innocuous fly was largely ignored until the 1991 publication of a Fauna of New Zealand volume by Dr Dan Bickel, an entomologist at the Australian Museum interested in this group of flies. Bickel noted the appearance of O. robusta adults suggested that their larvae fed on some common resource and that discovering what this resource was would be of interest. Dr Bickel has visited the Entomology Research Museum and currently has specimens on loan from the collection for his research. In 2012, Richard Chynoweth, a former AGLS Faculty postgraduate student, and now a Research Manager at the Foundation for Arable Research (FAR), fortuitously discovered fly larvae attacking grass grub (Costelytra zealandica (White, 1846)) pupae while sampling soil near Southbridge, 25 minutes from Lincoln. 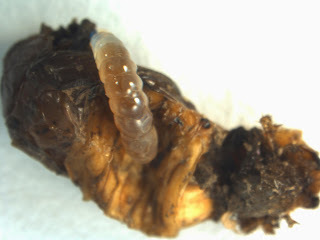 Grass grub, is one of New Zealand’s most damaging pasture pests, responsible for multi-million dollar losses annually. These larvae were reared through to adult flies by Bruce Chapman, Lincoln University Associate Professor in Entomology. Subsequently, the flies were given to John Marris, Curator of the Entomology Research Museum, who identified them as Ostenia robusta by comparison with specimens held in the Museum, including one collected by long-term Lincoln staff member Margaret McPherson in 1967, around the time that the Museum was established. Distribution records for the species were obtained from consultation with curators from other New Zealand entomology collections, including John Early from Auckland Museum, a former Lincoln University staff member, and Dr Cor Vink from Canterbury Museum, who completed his PhD in invertebrate taxonomy at Lincoln. Larvae of O. robusta had never before been reared to the adult stage and, despite many decades of intensive research on grass grub, these larvae had never been recorded attacking the beetle pupae. However, DNA molecular analysis of the specimens was used by Dr Karen Armstrong and Dr Anastasia Chomic from the Bio-Protection Centre to assist in identification. The identification was subsequently confirmed by Dr Renato Capellari, a dolichopodid fly specialist from the University of Sao Paulo, Brazil. Over the 2013-2014 summer, Lincoln University undergraduate student Lisa Watkins won a FAR summer scholarship in which she completed further research on Ostenia biology. This research may lead to enhanced biological control of grass grub and reduce losses inflicted by this pest." This is just one example of many that demonstrates the value of the Entomology Research Museum in providing fundamental support for research and education, much of it revenue earning. The Museum is not a dusty old Victorian institution. It is a modern, relevant and vital asset that helps to maintain Lincoln’s longstanding reputation for excellence in insect research. This is why the Museum must not be lost from Lincoln University.